Google I/O is now less than a month away, and Google has updated the website with all the events, keynotes, and sessions it will hold. 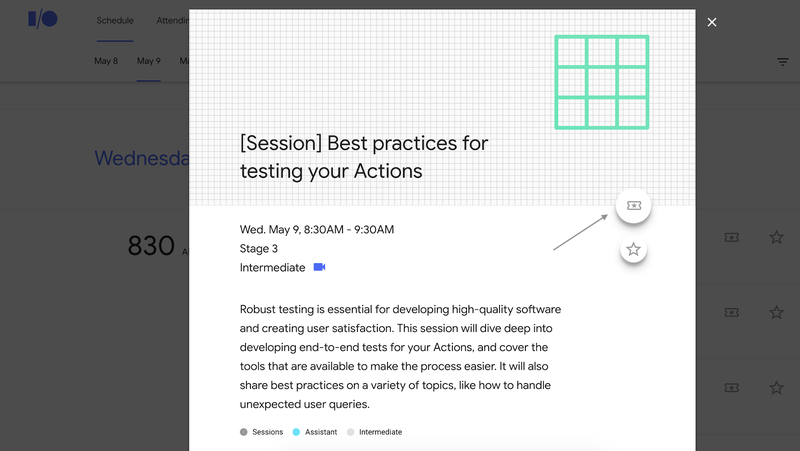 The schedule could be changed at Google's discretion prior to the big day, but attendees can head to the I/O site right now to reserve seats for the sessions as currently listed. To get your seats, head to the I/O schedule and browse the offerings. Sessions have a small ticket icon, which you can click to reserve a spot (provided you're logged in as an attendee). There is no limit to how many sessions can be reserved for each day, but you only get one reservation per time slot. Also note that you can only get reservations for sessions, not other types of events. Google expects to have more than 160 keynotes and sessions covering everything from Assistant to app performance debugging. I/O runs from May 8th to the 10th, but most of the news will happen on day-one when Google has its keynote.